High quality 100% hand-painted oil art painting on canvas provided by Wieco Art. Our painter of world-class artisans painstakingly reproduces all of our paintings by hand, using only the museum quality oil paints on canvas. We stand by our top quality and strive to make your favorite paintings as original paintings nature of the artwork. The edges of every canvas paintings are painted and the surface is covered with clear plastic film layer to protect the wall paintings. Canvas painting are wrapped and stretched on durable wooden frame with hooks mounted on each panel for easy hanging out of box. Redefine your living style now with this unique and elegant piece of art paintings created by professional artist from Wieco Art. Wieco Art is one of the largest online suppliers for modern canvas wall art, including 100% hand painted oil paintings on canvas, acrylic paintings, Mixed-media paintings, Watercolor paintings, Drawings, Painting photograph, Photo to portrait painting, Photo to canvas print, Canvas prints. Our wall decor category provides high quality yet affordable canvas art. We feature a paintings gallery with thousands of decorative oil paintings for sale and beautiful canvas prints from a multitude of periods and styles including modern art, contemporary art, decorative art, abstract art, famous art, pop art and much more, to satisfy all of your fine art needs. As we continue to grow the new paintings and original art collection, whether you are looking for a famous paintings reproduction, such as Van Gogh paintings, Picasso paintings, Dali paintings, Monet paintings, Abstract paintings, Landscape painting, House oil paintings, hotel oil paintings, folk art or High definition oil pictures photo prints on canvas, you will find it at Wieco Art gallery. A perfect Christmas and New Year gifts for your relatives and friends. High quality 100% Hand-painted oil paintings on canvas painted by our professional artist with years of oil painting experience. A perfect Christmas and New Year gifts for your relatives and friends. 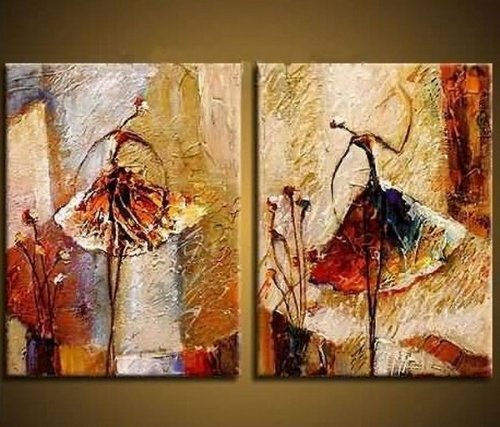 2 panels stretched and framed decorative people dancing canvas oil paintings set for home decorations wall decor, each panel has a black hook already mounted on the wooden bar for easy hanging out of box. Authentic Wieco Art Paintings and home art are packed in carton box with "Wieco Art" logo printed on each box. Oil paints or Acrylic paintings on canvas, A perfect wall decorations paintings for living room, bedroom, kitchen, office, Hotel, dinning room, office, bar etc.. Gift card is also available upon request. As each painting is 100% hand-painted, actual paintings may be slightly different from the product image. Due to different brand of monitors, actual wall art colors may be slightly different from the product image. If you have any questions about this product by Wieco Art, contact us by completing and submitting the form below. If you are looking for a specif part number, please include it with your message.